When we began our work four years ago, it wasn’t clear how well solar would work in West Virginia. As it turned out, the answer is: just fine! Solar United Neighbors of West Virginia recently hit an important milestone. More than 1 megawatt of solar has been installed through our local solar co-ops! 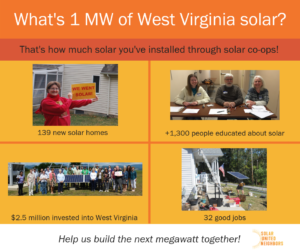 This is thanks to the efforts of our great local partner organizations and a growing community of West Virginia solar supporters. You’ve talked to your neighbors, hosted open houses, volunteered at events, and stood up for your right to go solar. We can’t do this work without you, and we thank you for supporting solar in the Mountain State. To date, we’ve organized 20 solar co-ops throughout every corner of the state. And some areas have hosted solar co-ops more than once! Wheeling, Morgantown, Charleston, Fayetteville, and Monroe County have all been sites of multiple solar co-ops. The Mountaineer Country Solar Co-op, which encompasses Monongalia, Marion, Harrison, Taylor, and Preston counties, is currently active and recruiting new participants. And, the New & Gauley Rivers Solar Co-op is wrapping up but open to new participants until the end of this year. Beyond the people who’ve gone solar, we’ve educated thousands more about the benefits of solar energy and how solar can help us take control of where our energy comes from. We’re excited to continue this work to reach the next megawatt! Donate to help us get to the next megawatt of solar in West Virginia.